I’m all about making that dough and so should you! Let’s face it, take-out pizza is expensive. With a small amount of effort and a bit of creativity you can easily make restaurant quality pizza at home, the key is good quality dough made properly. It is something that can be made by hand or in a stand up mixer and either way you do it as long as you follow the steps accordingly it will work. It can be held in the fridge for up to 2 hours and in the freezer for up to 3 months provided you wrap and seal it properly. Once the dough is ready get a clean flat surface floured for rolling or stretching out the pizza dough, rolling will give it a flatter but more uniform crust and stretching will keep the pockets of air in the dough giving it a lighter and airy crust. The only other tips is to use good cheese for the pizza, nothing is worse than having a bland rubbery mozzarella finish your otherwise excellent pizza. If you can get full fat mozzarella you will be off to the races. Also don’t limit your creativity to just red sauce and mozzarella; Alfredo sauces, pesto, oil based or even in rare cases BBQ sauce can all complement the right ingredients and cheese. Below is a recipe for quick and simple pizza dough that can be mixed in 10 minutes and ready to roll or store in an hour. You will need 2 larger mixing bowls (one to mix and one to store). 1) In one of the bowl add the water and sprinkle the yeast packets in, let it stand until the yeast and water mixture starts to get foamy (about 5-7 minutes depending on the temperature of the water). 2) Using a whisk stir in the sugar, oil and salt into the yeast mixture. Sift in your flour while mixing until sticky dough develops. Once you can form it into sticky ball transfer the dough into an oiled mixing bowl and brush the top with oil. Cover the bowl with plastic wrap and set aside in a draft free, room temperature until it doubles in size (about an hour). 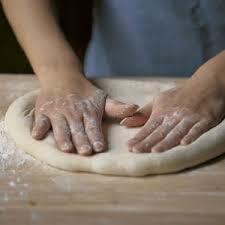 Once the dough is ready knead it on a floured surface before using it. If you don’t use it right away it can hold in the fridge for up to two hours. 3) If you plan on freezing it, pre portion to the size you need and store in an air tight freezer bag. It will keep its integrity for up to 3 months.